There are over 200 different types of fleas in America. The most common type of fleas to affect humans is the cat flea or xenopsylla cheopis. The cat flea will happily feed on cats, dogs or humans. Flea bites on humans are often found on the ankles in groups of three. You can treat the flea bites on your body, but in order to stop the cycle of the fleas, you need to also treat your home and any infected pets to stop the life cycle of this flea in your home. 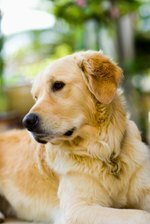 Start flea treatment by killing the adult fleas that are most likely living on and attacking the host pet. Give your pet a flea bath or flea dip. You can also treat your pet with a rub of a dust formulations, such as those containing boric acid, silica or diatomaceous earth. Take a handful of this substance and thoroughly rub into the pets coat. Treat your house. Take special care to treat any "hot spots" such as pet bedding, rugs, carpets and furniture. Use a flea bomb or one of several natural solutions to rid your home of these pests, such as diatomaceous earth. Wash the affected area on yourself with an antiseptic soap and warm water. Clean and dry the area. Apply 1% hydrocortisone cream to stop the itching and reduce the redness of the flea bites. If the flea bites are swollen, put an ice pack on them to reduce the swelling.